In many areas of the Chesapeake Bay watershed, cypress swamps are important habitats. These unique areas are dominated by bald cypress trees, which provide vital structure, retail soil and provide shelter for hundreds of plants and animals. These dense swamps also contain cedars, red maples, oaks, hickories, ashes, river birch, gums, and other trees. Beneath the trees grow shrubs, herbaceous plants, ferns, and other native plants. In spring, swamp plants burst into flower, attracting insects, birds, and other wildlife. During summer, berries, fruits, nuts, acorns, seeds, and other foods ripen. During the fall season, the abundant food supplies, sustain birds, mammals, and other wildlife. 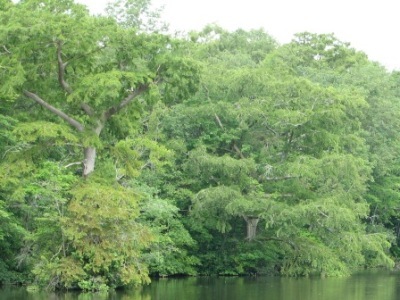 Although difficult to visit by land, bald cypress swamps usually have water access by kayak, canoe or small boat. Cypress swamps are favorite destinations of nature lovers, birdwatchers, photographers, and anglers. One of the many unusual sights in these swamps are cypress knees. These odd looking formations are part of the bald cypress root system. The knees rise above the ground which help to anchor trees in the wet mud. Cypress knees also allow roots to breathe while submerged in swamp water. Ecosystems benefit from these unique structures as they help retain soil, deter erosion and provide crucial above water structures for plants and animals of the swamp. Pristine cypress swamps occur in the Chesapeake Bay watershed in tidal and non-tidal stretches of rivers including the Potomac, Choptank, Nanticoke, Wicomico, Pocomoke, and other rivers. All of these rivers and their tributary creeks are recognizable by their dark color, a result of the tannic acid produced by cypress trees.